When you remove the files once added for creating a disc, a confirmation dialog appears. You can disable it with the option Confirm removal of files and folders. At times when creating a disc, you may add shortcuts of files and folders instead of the original ones. DVD Author Plus replaces them with the actual files and folders so that you don't have to worry about data not being added. You can change the extension of the files when they are added to create a disc. A help dialog appears when you try to change the extension of a file. Disable it with the option Confirm extension changes while renaming files. 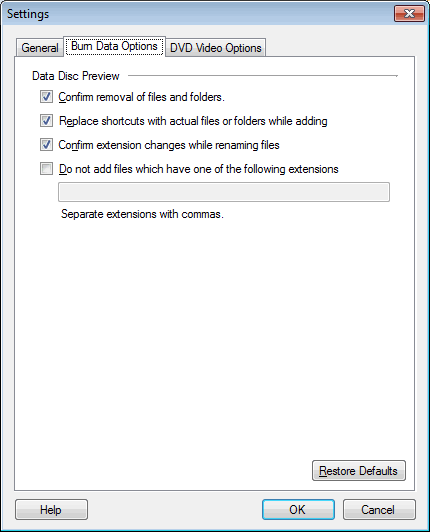 The option Do not add files which have one of the following extensions does not allow to add files with the specified extensions for creating a disc. Note: These settings apply only when creating a data disc.